Do you still remember the investment plan that I mentioned last week? That is with the thousand dollar savings each month from not hiring a maid. I’m going to share with you the secret today. It’s going to be FUN. So, sit tight and fasten your seat belt! Two weeks ago, I told the Husband that I plan to make some investment with the $1000 savings that we make each month from not hiring a maid now. He rolled his eyes and looked at me with full curiosity. He knows jolly well that his Wife doesn’t know much about investment. Truth be told, I don’t even know the interest rates on my savings account. He thought that I was just joking until the day when my “investment” finally arrived at our doorstep. 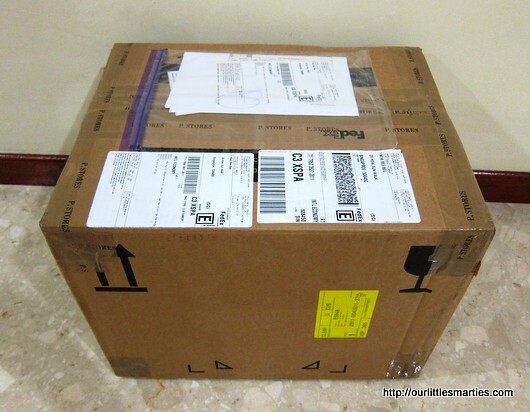 It came in a rather-dirty Fedex box, shipped all the way from Hawaii. This is it! Let’s open and see what is inside. Nicely wrapped in bubble pack. First clue revealed. 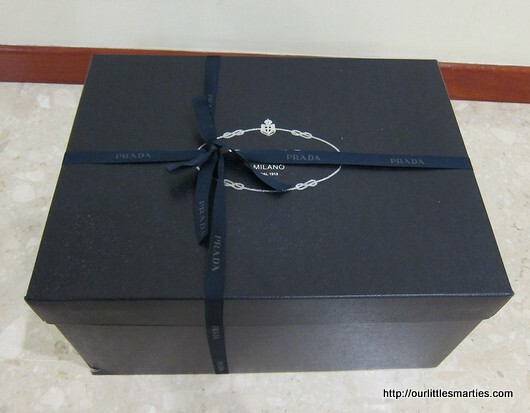 It’s a PRADA gift box and dust bag! 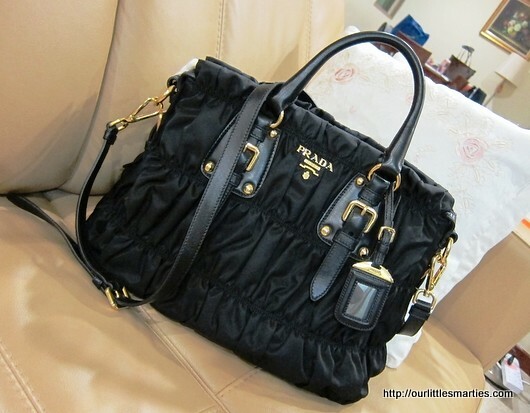 The answer is – my new Prada Tessuto Gaufre BN1336 in black. This bag is oh-so- gorgeous that I can’t take my eyes off it the first time I saw it. It’s the kind of beauty that never goes out of style. It’s timeless! This picture is unable to bring out the beauty of this bag due to poor lightning. In actual, the gold tone hardware makes the bag even more elegant. This bag is twice the price of the LV Neverfull that I bought earlier this year. Now, that I finally owned it, I’m sooOoo happy! 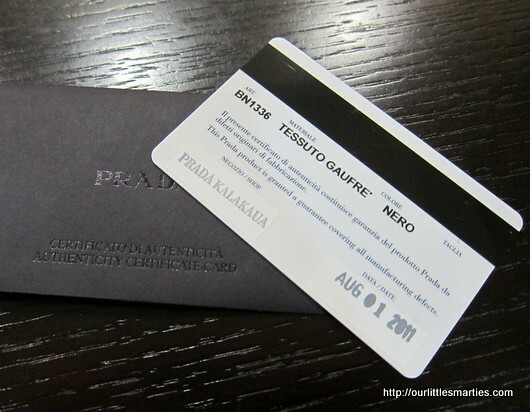 The authenticity card from Prada. The Husband couldn’t believe it that this is my so-called “investment”. He nagged for a while, but alas, he said “As long as you’re happy, it’s okay”. With this, I’m determined to be the best of friends with Tefal, the iron and Karcher, the vacuum cleaner. I’m eyeing for another Prada or Gucci bag for Chinese New Year. Errmmm, maybe Christmas. sososo niceee.. share share where u order ? why from Hawaii ? now u make me think twice should i too take over the broom stick ! ouuuuuuuu…. Yes, exactly! And they make us feel good and happy too! after reading ur blogs..i feel inspired to get a nice bag and the clarisonic mia..
the last time i got anything for myself coming to my house as a overseas package was a pair of boring fit flops so that i can run after the kid.. Sounds like you really need to get something for yourself! =) We need to reward ourselves for our hardworks and continue to motivate ourselves to work harder for these “rewards”… Go and get something that you like this weekend and have FUN! Cheers! I hope I didn’t disappoint you with my dumb “investment” plan, haha! Truth is I’m not the type who is good in investment and financial planning… Yeah, the Lady Dior lambskin bag is classic and gorgeous! I’ve learnt that investing in a designer bag is better than buying lots of ordinary bags… At least they can last, and even if you’re bored with them, you can trade-in to 2nd hand store.. Saves a lot of space too! Lovely bag, Emily! One of women’s weaknesses. Thanks, Haruki! Yes, it’s a very beautiful bag. i love the miu miu or balenciaga..but haven made the plunge..
Great! The clarisonic is really a good buy, and I’m sure you’ll love your cleansing regime again after you use Clarisonic. 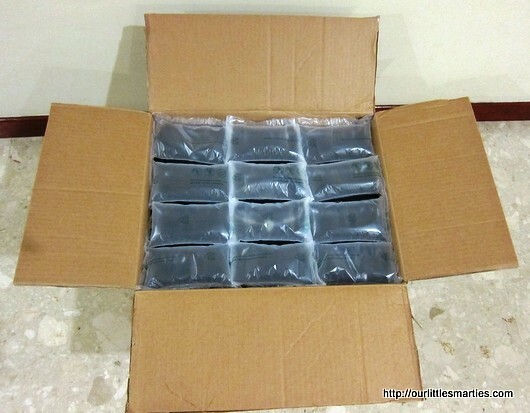 Oh, I din know that they don’t ship direct to Singapore now. What a waste! is this a leather bag too ? Ohh nice bag I like it too! 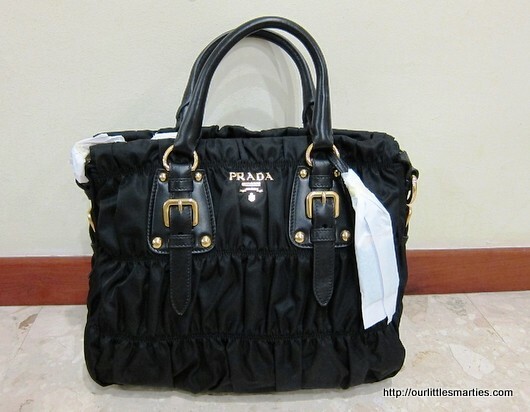 I managed to score one Prada bag nylon for less than 1K from one of the sites similar to Groupon. Got lots of scolding from hubby (worried that I got cheated) but the deal turn out geniune. Still so happy with my purchase. Good buy! Enjoy your bag too! Do you get it from Runway? 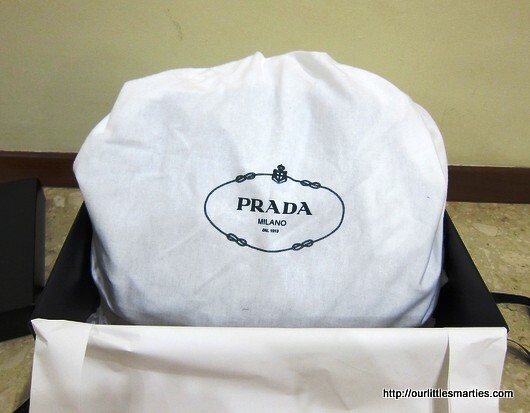 I saw that it has quite a lot of Prada bags at good prices.